This colorful bookmark illustrates our PowerPlate on the front and our resource programs on the back. Featured programs are The Power Plate, Nutrition MD, Food for Life, Nutrition CME, and 21-Day Vegan Kickstart. 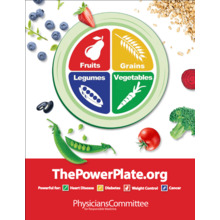 This is a great way to draw attention to PCRM's most popular programs and resources. Power Plate Bookmarks has been added successfully to your wishlist. This colorful bookmark illustrates our PowerPlate on the front and our resource programs on the back. Featured programs are The Power Plate, Nutrition MD, Food for Life, Nutrition CME, and 21-Day Vegan Kickstart. This is a great way to draw attention to PCRM's most popular programs and resources. Discounts when ordering quantities over 5 ($.20/each), 25 ($.17/each), 100 ($.14/each), and 500 ($.10/each). Free Shipping (U.S. only).